The recent dashboard update to the XBox 360 delivered Windows Live Messenger functionality to Microsoft’s next-generation console, which the company claimed, makes Xbox Live “the largest social network on television.” However, right now Xbox users are limited to inputing text using a virtual on-screen keyboard or can choose to plug in a USB one — which is hardly ideal. 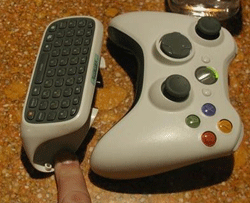 To solve this problem, Microsoft will soon be releasing a new input device called the ChatPad, which adds a snap-on QWERTY thumb-board to the traditional XBox controller. It’s a pretty tight fit so you don’t have to worry about accidentally knocking it off during gameplay. The unit isn’t really that heavy and doesn’t really impact the weight or balance of the Xbox 360 controller. I think this is something that a lot of people will snap on and leave on. Using the buttons will take a little getting used to but like any small QWERTY keyboard once you get used to it you’ll be ripping off long diatribes in no time. Husemann also reveals that the ChatPad has a backlight, which automatically turns on and off as you start and stop typing, rather like a mobile phone. Microsoft claims that this means the backlighting won’t impact too much on battery life. [the ChatPad] feels great, and I think a lot of people are going to snap this sucker up (especially now that Live is hooked into Live Messenger). Pricing and availability haven’t been announced yet but I think this is going to be another great Xbox accessory that a lot of people are going to want to pick up. From what I know of the product, I think Husemann is spot on. What’s also clear is that Windows Live Messenger integration, along with the XBox’s media extender (and forthcoming IPTV) functionality, further positions the game console as Microsoft’s trojan horse, designed to deliver Internet services into the living room.